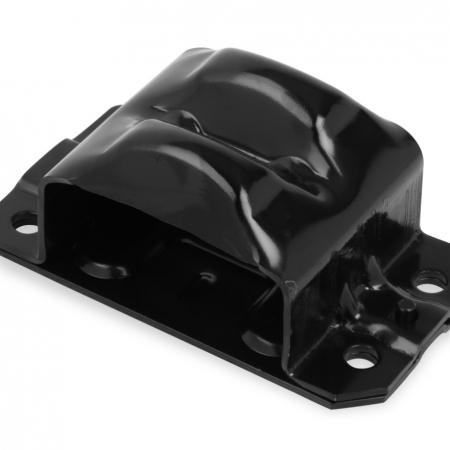 These brackets were specifically designed for the 1994-1996 GM B-Bodys. 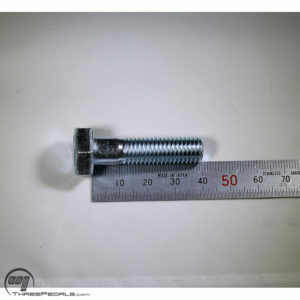 They provide a bolt-in installation for any 1994-1996 Caprice, Impala SS, Roadmaster or Fleetwood Brougham Sedans, as well as the Chevrolet/Buick wagons of the same era. Direct fit design. 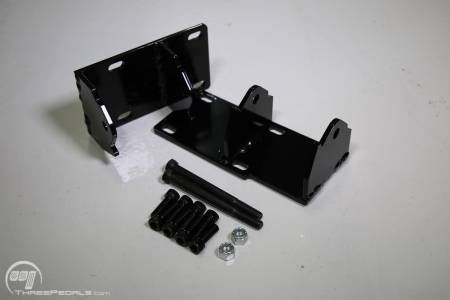 Simply bolt KDS brackets to your LS engine, and lower the engine into the car. The right side bracket accomodates the rear-set mount cushion that is specific to the LT1/L99-era cars. 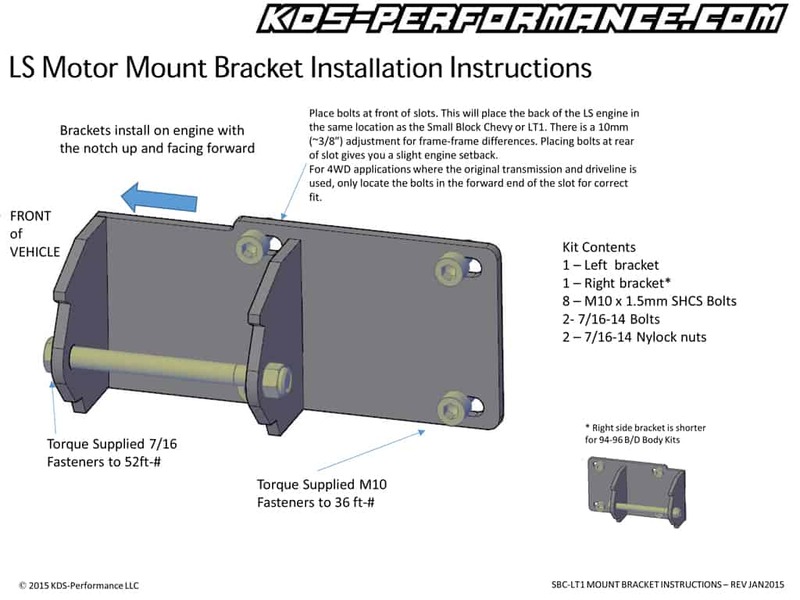 KDS brackets fit using the OEM installation locators. They locate the LS engine in the same place as the 5.7L LT1 or 4.3L L99 used to fit. You maintain your transmission location, and driveshaft. 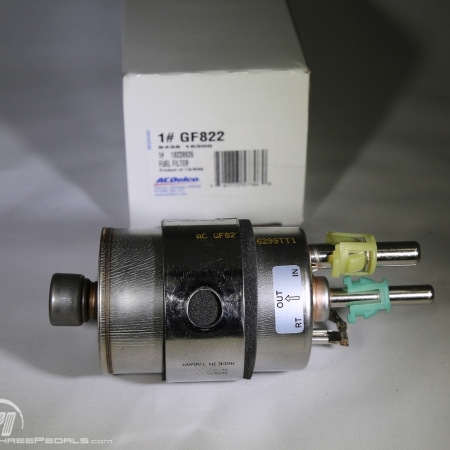 You can reuse your existing 4L60E transmission. 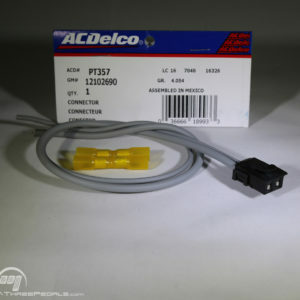 Even if you have modified your car with any of the aftermarket B Body transmission crossmembers, you can retain the parts you already have. Maintain driveline angles. KDS competitors change the driveline angle by as much as 2 degrees, but do not tell you that. 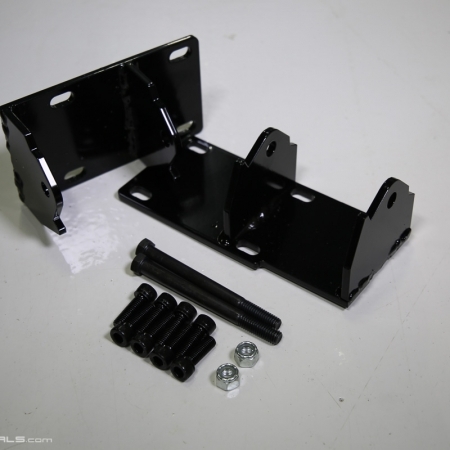 KDS mount brackets use the OEM frame mount isolators. Some competitors use re-purposed control arm bushings!!?? KDS mounts are a great match for the GM 1998-2002 Camaro/Firebird (aka F-body) LS1 oilpans. These pans are still available new from GM Performance Parts dealers Be sure to order the oil pickup tube and the dipstick and dipstick tube in order to have a complete kit. 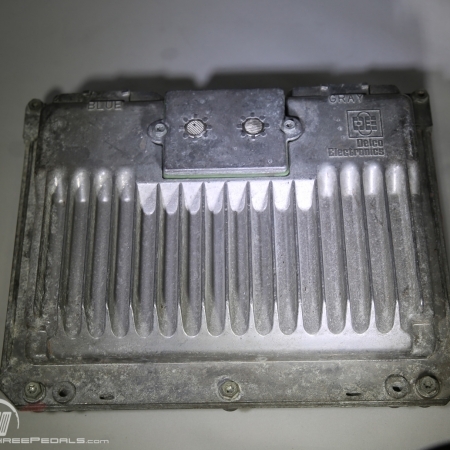 The Holley LS Swap oilpan is another suitable option, PN 302-2. This pan is a very close replica of the GM LS1 Camaro/Firebird oilpan. 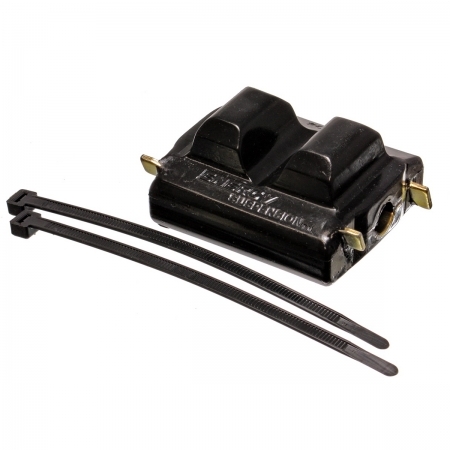 *** The GM Musclecar pan is a very deep pan, and will hang 2-1/8″ below the engine crossmember. While it will physically clear the engine crossmember, the bottom of the pan is unprotected if you encounter a deep pothole or a “whoop” in the road where the suspension bottoms out. What’s a whoop?… They are the dips in the road with all the gouges in the pavement from other cars bottoming out. For this reason, KDS does not recommend the use of this pan, ultimately it is your choice. Headers/Manifolds KDS customers have reported good fitment with various headers made for 98-02 LS1 F-bodies. Minor trimming to the engine crossmember braces may be required, but these braces do NOT have to be removed completely. If you are on a budget, or want a more stock appearance, 2010+ Camaro manifolds, 2008 G8 manifolds and 2004-2009 V8 Trailblazer/Envoy/Rainier/Saab 9-7x manifolds are a good fit with good frame clearance.